NewerTech has released a clear dual mount shelf for the 2010 Mac mini called the NuShelf. The NuShelf allows you to easily cradle your 2010 Mac mini under your desk, shelf or cabinet in order to save desk space. Rear cutouts allow easy access to your Mac mini's ports and power button while the large front opening allows full access to your Mac mini's optical drive and Apple Remote IR sensor. 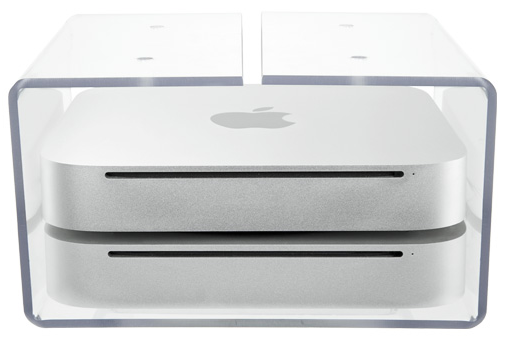 The NuShelf is able to accommodate up to 2 Mac minis or one Apple Time Capsule and one Mac mini, which ever combination you choose. The NuShelf for the 2010 Mac mini and Time Capsule is available now for $44.95.